does anyone know where to get a replacement rear pagehiln master cylinder. ... hopefully your Italian is better than mine. 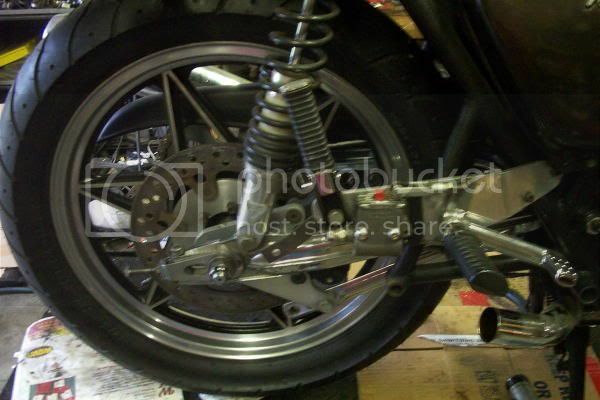 Since then, I spotted one on a bike on the SOHC4.US site, it looked identical to a Pagehiln but was made by a US firm. It may have been Penske, certainly was a firm I assopciate with Nascar etc. The bike belongs to a member called 736cc on there, it's a red K-series with a Yoshi exhaust. I emailed him about the m/cyl but never got a reply. Let us know what you end up with. I believe that the PAGEHILN brake master cylinders were a loose copy of the AIRHEART versions that were/ are common in the US dirt track racing scene. If you go to www.tolomatic.com it seems they still make them..! I havent had much luck with seal kits on mine...still leaks after fitting a LOCKHEED kit,so maybe thats the next option...? If a few of us want a master cylinder,maybe its worth trying to get a discount deal for a bulk purchase....?After all ,if these are identical to the PAGEHILN versions,thats a lot of potential buyers...? A great find! Altough I did not fild them on the Tolomatic web site, but Google directed me there: http://www.airheart-brakes.com/la-master.html and that really looks like the Paghelin. At last we have a source for the "problematical" rear master cylinder...would anyone know if US threads/fittings are the same as metric..? I just cant remember if they are.. I would say it's non-metric - I hesitate to call it a "standard" thread but it looks like 1/2-27. That's an odd size thread for a brake fitting, usually I find they are 10x1mm or 10x1.25, indeed mine has a 10x1 fitting which is actually a pressure switch for the brakelight. I wonder if that 1/2" thread could be used with an insert to bring it down to 10mm? 10x1 or 10x1.25 are the only thread sizes I know for brake lines, too, but the diagram says differently, altough the '1/' part is just wild guessing. The only 27tpi ones are 1/16 and 1/8 sizes, so the presence of the 2 in the pic is a bit of a mystery. The 1/8 size looks interesting, .405" isn't far off 10mm and 27tpi is almost 1mm pitch. I have an identical Hurst-Airheart on my Dunstall. It is an older unit and actually has 10X1.00 threads for the brake line. It is a nice unit and works great. Their smaller size lends them self to many applications. The caliper has since been upgraded to a newer underslug unit off a Ninja or GSXR and the wheel has been changed to a spoked wheel. Like they say on the Airheart page, dont mix and match brake fluid with mineral oil. It destroys the seals in the calipers and master cylinders and makes them useless.